Summary N900 class small-biz access point with PoE and ability to "cluster" with 15 other APs for control. 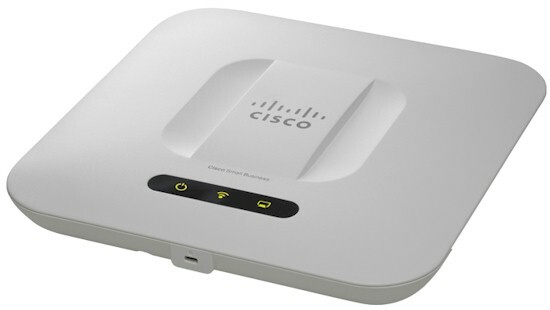 Our last look at Cisco's small business access points were their N300 WAP121 single band and WAP321 selectable N300 dual-band almost two years ago! While time may fly, it appears that Cisco's small business AP design team moves much more slowly. Although they have added this new 500 series, one of which I'm looking at today, these are N450 / N900 class APs, not 802.11ac. The WAP561 Wireless-N Dual Radio Selectable Band Access Point is an N900 class (simultaneous 3x3 dual-band 802.11abgn) AP. Its sibling WAP551 carries only a single radio making it selectable dual-band N450 class. Other than the single radio, the two APs have the same feature set. The WAP561 is much larger than I expected with its 9" x 9" footprint—almost twice the size of the single-band WAP121 at 5" x 5"! The WAP321 is in the middle at about 6.5" x 6.5". The top and bottom are pretty simple, with power and wireless and Ethernet activitity lights on the top and a single 10/100/1000 Mbps Ethernet port on the bottom. There is no power switch like on the WAP121 and WAP321. Power is expected to come via 802.3af PoE through the Ethernet port, but the AP doesn't come with an injector. Cisco sent an SG300-28P switch instead (Doug reviewed the SG500-28P awhile back) along with a second WAP561 so that I could check out the multi-AP "Single Point Setup" feature. But it was much more convenient to use the SB-PWR-INJ1 injector they previously sent for the WAP321 review. The WAP561 comes with a mounting bracket, making removal for service easy. Here's a composite shot done for the WAP321 so that you can get the gist of how the bracket works. The FCC photos inside shot shows a clean and tidy design. The CPU and memory is in its own RF "can" on the left. Two identical mini-PCIe modules on the right are the two radios. Table 1 summarizes the key components and includes the WAP321 for comparison. Cisco went with a beefier (and separate) CPU for the WAP561 vs. a single-chip design for the less-expensive WAP321. I put other pictures of the 561's innards in the gallery that you'll find later on.